In a large mixing bowl, add in the flour, cocoa powder, instant coffee, ginger, cinnamon, cloves, baking soda, and salt. Whisk to combine. In a separate bowl, add in the butter, granulated sugar, and brown sugar. Beat with the hand mixer on medium/low for 3 minutes until light and fluffy. Scrape down the sides of the bowl. Add in the room temperature egg yolk and mix for 1 minute until combined. Scrape down the bowl. Add in the molasses and vanilla. Beat with the hand mixer until smooth. Add all of the dry ingredients into the wet mixture. Mix on low to avoid the flour from flying out of the bowl. Scrape down the bowl. Mix until the flour is not quite fully incorporated. Add in the chopped ginger and chocolate. Mix until the remaining flour is mixed into the dough and the ginger/chocolate is evenly distributed. Scoop the cookie dough onto a large piece of plastic wrap. Flatten the dough and cover the top with either the extra plastic wrap or another piece. Refrigerate for at least 2 hours. Spray muffin pan with non-stick cooking spray. If making cookies without muffin pan, line two baking sheets with parchment paper or silicone baking mats. Add about ¼ cup of granulated sugar into a shallow bowl. Using a medium cookie scoop or tablespoon, scoop out the cookie dough. If you're not using a muffin pan, form the dough into a ball by rolling in between your palms. Add the dough into the shallow bowl of sugar. Roll around until the scoop/ball is coated with sugar. Place the balls into the muffin pan or on the parchment paper 2 inches apart. Press the dough down using a cup until it's about ½ inch thick. Place into the oven and bake for 13 minutes. Rotate the baking pan at 7 minutes to ensure the cookies bake evenly. Remove from the oven and let rest for 15 minutes before turning the cookies out. Place the unmolded cookies onto a cooling rack.Let cool completely. 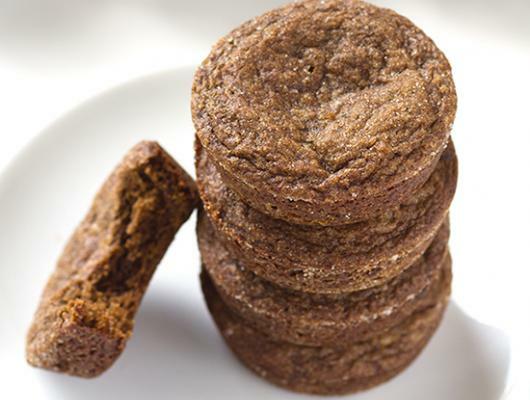 Double Ginger Molasses Cookies - For all of the ginger lovers! 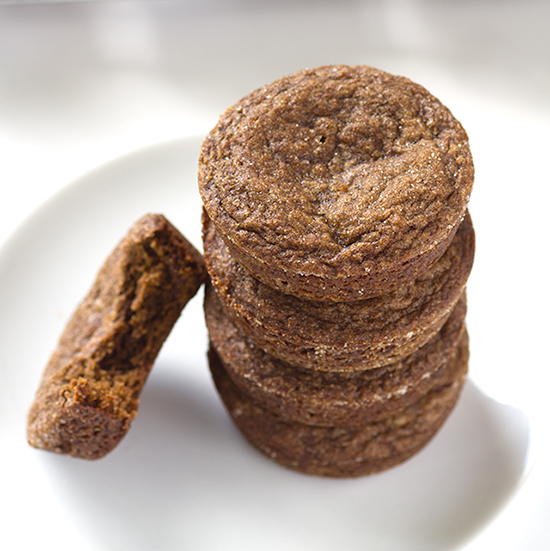 These cookies are packed full of ginger and molasses with a small addition of cocoa powder and instant coffee.